Successfully Added Geeetech A10 DIY 3D Printer - Open Source GT2560 Control Board, 360 Degree Full View to your Shopping Cart. A10 makes the best of the building platform and gives you a full view of the printing details. Geeetech A10 3D printer, using open source GT2560 control board, is reliable, cost-effective and easy-to-assemble. Running stable, it aims to provide users with quality printout and satisfactory printing experience. 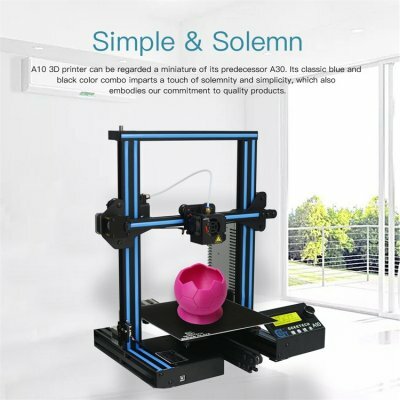 A10 3D printer can be regarded a miniature of its predecessor A30. Its classic blue and black color combo impart a touch of solemnity and simplicity, which also embodies our commitment to quality products. The modularized design provides you with an easier assembly experience. Keeping Prusa I3 3D printers’ gantry structure and with its build volume as 220x220x260mm, A10 makes the best of the building platform and gives you a full view of the printing details. Its well-designed extruder greatly reduces the risk of clogging or leaking. The Bowden design of the extruder makes the printing head move lightly and stable, greatly enhancing the printing efficiency. The V-shaped wheels and rails on each axis, made from the wear-resistant aluminum profile, could, in a large measure, reduce the printing noise and offer you a quiet 3D printing environment. The DIY Geeetech A10 3D Printer Kit comes with a 12 months warranty, brought to you by the leader in electronic devices as well as wholesale 3D Printers.